You all know by now that I have a deep love for string blocks. 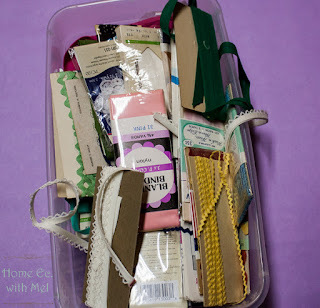 Not only is my string block post one of my post popular posts ever, I absolutely hate to toss fabric. I've been making the blocks from time to time as my string box overfills. Not only do I hate tossing fabric I use up as much of the paper I possibly can. I may never end up with enough string blocks to make a quilt but I have more than enough to make mug rugs in any size my little heart desires. For this string block mug rug ,I went with 5" blocks. 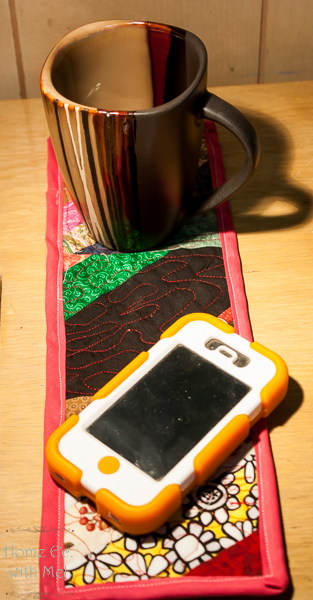 It's the perfect size of mug rug for my sewing table. I can have my coffee, tea, or water beside me and not worry about leaving a ring behind on my table. These are so easy to make and if you already have the blocks made you can finish the project in about thirty minutes. I'm not really a mug rug person. I remember my grandma had some plastic canvas coasters that said mug rug on them. I like coasters. 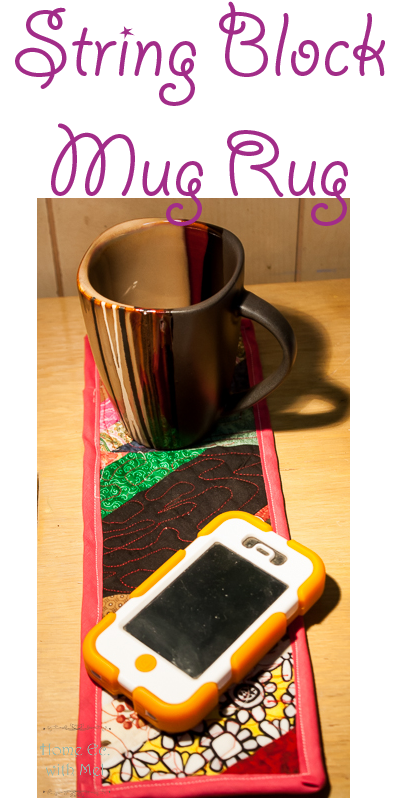 I know that sounds odd since mug rugs are all the rage in the quilting community. My love of coasters might be obsessive, though. I like my coaster to match the room it is in. I had fully intended to make a set for the studios with photo transfers of quilts. That hasn't happened and I needed something before I left rings on 50-year-old wooden cabinets that had made it that long without one. The mug rugs also allow you to practice your free motion quilting and your binding. 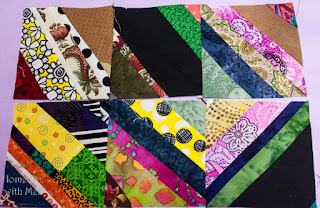 Since those are two of my weakest points in quilting I try to find as many smaller useful projects to do them on. 6 string blocks of your choice size, mine is 5"
Really could this get much simpler? 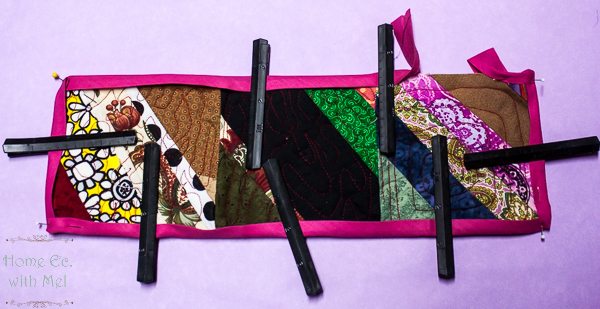 You could whip these out as Christmas gifts for your whole quilt guild in an afternoon. If you have a machine that can embroider you could really personalize each one. If you are like me and really need to get more familiar with your embroidery machine here's the perfect small project for that. Sew three of the blocks together to make a strip. Then do it with the other three. Now you need to measure your strips so you know what to cut your batting. Mine measured 5x14. I cut my batting the same size as my strips of string blocks. I don't know why I did that. Batting should always be cut slightly larger than your quilt top. I must have been thinking of something else. This is a great time to use up leftover batting. I'm using my favorite batting Warm and Natural. It is so hard to get good picture of fuzzy stuff. Then you make a quilt sandwich. I used a couple of safety pins for this project. You could use spray basting too. It's really your preference. This is a small enough project that you could try something new. Now it's time to do your thing! Quilt these however your little heart desires. I practiced some free motion patterns on each block. If I was going to give these as a gift I would have gone with one pattern overall and would have spent a little more time with them. This was just a practice quilting piece and other than you guys no one is going to see it. You won't tell anyone about my horrible quilting on this will you? I so should have over cut that batting. I wouldn't have lost as much on my string block mug rug if I had done it right. This is the perfect example on not thinking while working on a project. Normally, I wouldn't use premade binding. I have a ton of it though. I think it reproduces on the shelf. I didn't realize until I was doing this Paul has a tub just like this. If you buy anything sewing related at a garage sale a bag of this seems to come with it. If no one uses it why is there so much of it? You can make your binding if you want or if you are like us and over ran with the premade stuff use it. Attach your binding in your preferred method. I used my glue method to attach mine. The black clips are hem clips for garment sewing. They work really well to hold the binding before the glue has dried or I iron it. You know there is no need to wait for glue to dry when we have irons in our studios. Think about all the ways you could change this up depending on who the recipient of this string block mug rug. You could make the blocks out of their favorite colors, add their name to it, quilt in their favorite motif, the possibilities are endless with this project. If you make one of these be sure to share a photo on Fiber Tuesday so we can all see what you made. I made some mug rugs this year and decided I really like them! I'm really liking them too!